Noah may have been dancing all week but the only thing dancing in my head last Friday was a vision of me plopped down on a nice comfy hammock. 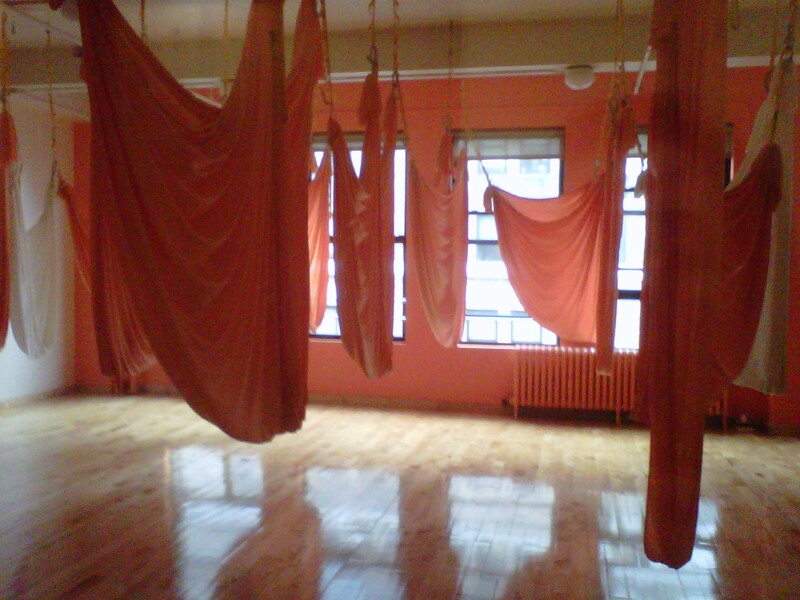 Yup, after a long, hard week doing nothing (see “Pass the Epsom Salt Please), I could hardly wait to get myself to an AntiGravity restorative yoga class. Here’s how the AntiGravity website describes it: “AntiGravity Yoga: Restorative is the gentle, healing side of AntiGravity Yoga. This powerful method focuses the mind…as it floats the body through a series of gentle gyro kinetic motions, deeply opening the entire spine, hips, and connective tissues of the body… This therapeutic method offers accessibility to students with physical limitations, but is loved by all as a portal into deeper spinal flexibility, and mind/body connection.” Ok, I admit it: I didn’t read this until AFTER I took the class, but I do know that restorative yoga is the relaxing form of yoga, the yoga of “non-doing.” I mean, although I had never done AntiGravity before, it was restorative so how hard could it be? I walked the five blocks to the yoga studio and eagerly showed up for the class. I asked the woman at the front desk, “This is relaxing, right? It’s fine for someone who hasn’t done this before, right?” While I asked these questions, I thought of my husband Joel on our last vacation. He immediately staked out the hammock and there he stayed, for hours on end. Now, this is what I was looking forward to! The front desk yogini smiled, pointed in the direction of the studio door, and said, “You’ll love it.” Ok, that was the only confirmation I needed. I walked into the studio and stared at these parachute-esque bright orange hammocks hanging on large hooks from the ceiling. I was the first one there (talk about eager to relax!) and was told by the assistant teacher to select a hammock. So I did. Right near the window. Then, she came over to me (let’s call her Jane) and said, “Have you done this before?” I said no and then she asked me to move right in front of the teacher as this way the teacher could more effectively help me. So I did. As Jane was adjusting my hammock and releasing it from the large ominous-looking metal hook, she looked at my engagement and wedding rings and asked me to remove them. “Remove them? Why?” I asked. “They will snag the hammock so you’ll have to take them off and put them on the floor in the corner,” she said matter-of-factly. At first I could not believe she was serious. But she was. In disbelief, I walked out and got a bandage and literally bandaged up my rings. My serene evening was off to a great start. Completely agitated and stressed out, I walked back into my so-called relaxing yoga class. By this time, the hammocks had started to fill up and class was about to begin. The teacher, let’s call her Donna, was smack in front of me and I had a feeling she didn’t like me very much (I’m thinking Jane told her I was difficult while I was out bandaging up my rings). She asked if I was a beginner. I told her I practice yoga regularly but have never done hammock yoga before. “What a great way to start. This class will be wonderful for you,” said Donna, enthusiastically. Ok, that’s two confirmations. Let’s go. The ring thing is now in the past. First up: we wrap ourselves up into little alien pods and stay there for a while. I don’t know, maybe it was only a couple of minutes but it felt like forever. It was pretty claustrophobic in here and certainly not relaxing. As we emerged from these pods, Donna explained how to go upside-down but I think I was the only one who needed explanation as everyone was already hanging out there. I clumsily made it into this inverted position by looking at the position of my next-door alien’s feet, but apparently I was doing something wrong as Donna asked me to come up from upside-down. So I did. And there I sat right side up, swinging on my hammock while everyone else was still upside-down. I thought Donna or Jane would come over to me and explain how to get back into that crazy-looking position. I mean, it didn’t look relaxing but it sure looked like fun. But I just sat and sat some more, wondering why they were not helping me out (I mean I was two feet in front of Donna. I did give up my prime window seat for a little bit of help, or so I was told.). Frustrated, I jumped out of the hammock, left the room and went to the ladies’ room just to kill some time. I re-entered the land of so-called relaxation just in the nick of time for the next pose. Donna came over to me, a little too late, to ask if I was ok and I honestly responded that I left out of boredom and because I had no clue what I was supposed to be doing next. Donna apologized for not explaining that apparently my hammock was positioned wrong. She said she thought I might prefer to come out of the pose. Hmmm, not sure where she got that idea but, whatever. I considered bolting but I knew I should stick it out. We did a few other forward folding and back-bending positions in the hammock which I would call awkward instead of calming. All I could think about now was, “Do we at least get a savasana (final relaxation pose)?” This class was stressing me out, big time. Finally, it was time for savasana. In the hammock. Except that we were huddled in fetal positions while Donna talked about visualizing being born and how it felt to be alive on your first day on earth. Now, I’m sorry but do any of YOU remember your first day on earth? And is this what you would want to be thinking about while trying to relax? All I wanted was a little time to think about nothing and de-clutter my mind. But no such luck. Finally it was over. Hallelujah! I practically jumped out of my hammock, collected my stuff and high-tailed it outta there. Back to my apartment to de-compress. I laughed to myself the whole walk home. It may not have offered the relaxation I was looking for but it sure proved to be comic relief. This was entertaining reading. Love to Noah! This is entertaining reading although I do not think comic relief was what you were looking for. Love to Noah! I love hammocks. I dream about hammocks. I wish I had a hammock in my office. 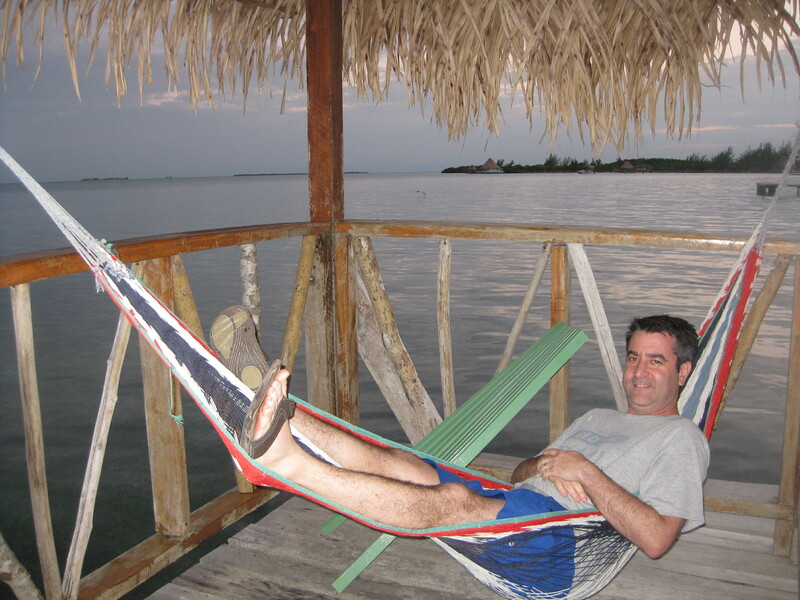 I would do conference calls from hammocks. I would eat my lunch in a hammock. Hammocks are our friends. Guess what? Since you’re a hammock pro, you will accompany me to an AntiGravity class next time you come to New York! I know Michelle! I had to write about it! Thanks for reading 🙂 Keep the comments coming! That is absolutely crazy! Even in So Cal I have never heard of anti-gravity yoga. Doing back bends without real support underneath you seems a little dangerous too. This is hysterical! Have you read “The Subtle Body”? The urthor says in it that Yoga is so malleable that it can be made into anything…which is exactly what we in the West have done! Give me Traditional Hatha Yoga anyday!! Hi Diane! I know, crazy!